» Basketball Rules in Indiana. Why Don’t the Pacers? Basketball Rules in Indiana. Why Don’t the Pacers? With respect to New York, Chicago, Philadelphia, Washington, D.C., and every other place in America that considers itself a “basketball city,” nowhere does the game matter as much as it does in Indiana. Spend a single January day in the state and it won’t take long to realize that watching or playing basketball is the pastime of choice for a majority of Hoosiers, even more so than auto racing, drinking heavily, complaining about the weather, or wondering why they still live in Indiana. This is why 13 of the 14 largest high school gyms in the country are in Indiana. This is why some of the state’s biggest heroes are Larry Bird, Oscar Robertson, Bob Knight, and Josh McRoberts’s knee-high socks. This is why the best sports movie ever made is entitled Hoosiers and not New Yorkers or Whatever the Hell People From Illinois Call Themselves. Simply put, Hoosiers spend so much time obsessing over basketball because the only entertainment alternatives in a state full of corn are to tip over cows or run a meth lab. But even though Indiana is the biggest basketball hotbed in America, professional basketball in Indianapolis seems to be dying a slow, sad death. The Pacers are fresh off their best regular season since 2004 and, frankly, one of their best seasons in franchise history, yet they had the second-worst attendance in the NBA this year. This after last year, when the Pacers had the worst attendance in the league despite making the playoffs for the first time in six years. In fact, the unfortunate truth is that the Pacers haven’t been in the top half of the NBA in attendance in each of the past 11 seasons, even though seven of those seasons produced playoff teams and one (2003-04) was the best season of basketball ever played by a Pacers team. Clearly the people of Indiana, while having immense local pride and an innate love for the game, aren’t interested in supporting the Indiana Pacers. Which begs the question: Why not? For a lot of Hoosiers, the obvious answer can be found in two words: Ron Artest. After winning 61 games in 2003-04 and advancing to the Eastern Conference finals, the Pacers entered the 2004-05 season as the best team in the NBA. All it took to change this was one November game in Detroit, when Artest attacked a fan in the stands after getting hit with a cup of soda and in the process triggered the darkest moment in NBA history, otherwise known as the Malice at the Palace. This single incident essentially made the franchise start over from scratch, since it was clear that the Pacers would have no choice but to wash their hands of their three best players — Artest, Stephen Jackson, and Jermaine O’Neal, who all played prominent roles in the brawl. After that season, Artest, who had been suspended because of his involvement in the brawl, was traded to the Kings and Reggie Miller, who had been the face of the franchise for almost 20 years, retired. At that same time, the Indianapolis Colts were led by one of the most likable guys in the NFL in Peyton Manning and were on their way to becoming one of the best teams in the league. This meant that many people in central Indiana who had only enough discretionary income to support one local sports team had to pick between an elite team with a likable superstar and a team covered in stench from the brawl and didn’t have its franchise player for the first time in almost two decades. The choice was obvious. Indianapolis, where basketball has always flourished, has been a professional football city ever since. The Pacers eventually dealt Jackson to the Warriors and traded O’Neal to the Raptors. Since getting rid of those two guys, it’s almost as if the Pacers have made it their focus to never let anything like the brawl with the Pistons happen again, and they figured the easiest way to do that is to fill the team with a bunch of good-but-not-great players so that the locker room won’t be full of egos and the group will be easy for fans to support. The good news is that it’s working. This year’s team, which, with a win against the Magic on Tuesday will claim their first postseason series win since 2005, is very easy to like. They play hard, share the ball, are fundamentally sound, and are led by the most underrated coach in the league in Frank Vogel. In other words, they are everything Hoosiers love to see in their basketball teams. The bad news, though, is that by playing unselfish basketball and not having a star on their roster, the Pacers have essentially turned into a college team. This seems like it would be a great thing for a basketball-savvy Midwestern city that favors simplicity over flashiness, but the truth is, most people in Indiana don’t want to cheer on another college team. Pro basketball teams are rarely successful in small markets that are within the vicinity of a college basketball blue blood (see: Kansas City Kings, Kentucky Colonels, Charlotte Hornets, Charlotte Bobcats, etc. ), and Indiana is rich with college basketball tradition with schools like Indiana, Purdue, Notre Dame, Butler, and Indiana State in 1979. In other words, most Hoosiers already follow a team that plays unselfish, fundamentally sound basketball, and they don’t have any desire to cheer on another. 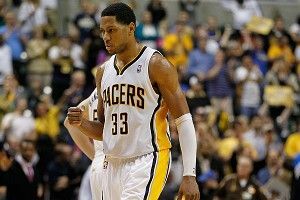 This is why the Pacers need a star. Not necessarily a LeBron, Kobe, or Durant, but they at least need somebody with a little bit of flash to his game. Then again, there’s a chance that that wouldn’t even be enough. I grew up on the west side of Indianapolis during the Pacers’ heyday, when Reggie Miller led the way with his obnoxious flopping and his deadly 3-point shooting, Rik Smits had one of the best mullets in NBA history, Antonio and Dale Davis were rebounding machines, Chris Mullin showed why he is the best player on the original NBA JAM, Travis Best was hated by every Pacers fan in existence, and Mark Jackson dropped dimes like a cashier in an earthquake. And even then, despite having two Hall of Famers in Miller and Mullin, the guy with the third-most assists in NBA history in Jackson, and reaching the Eastern Conference finals five times from 1994-2000, the Pacers weren’t as big of a deal in central Indiana as they probably should have been. Sure, there were die-hard fans, and sure, all the cool kids in my school owned a Miller jersey and mimicked his jump shot at recess by using the thumb of their offhand to help push the ball. But the fact was that the Pacers still weren’t selling out games all that often because many fans didn’t care until the playoffs rolled around. This is why I have my doubts as to whether the Pacers will ever be a huge deal in central Indiana. Maybe winning their first NBA title will change things. Maybe all it will take is a few consecutive years of deep playoff runs, since even though they weren’t selling out a ton of games at their peak in the ’90s, they were at least consistently getting large crowds. Maybe the Colts returning to the NFL cellar and facing a rebuilding process that will likely take at least a half decade will open the door for the Pacers to reclaim the sports throne of Indianapolis. Or maybe they’ll always play second fiddle to the Colts and the state’s college basketball teams, and their only hope of putting butts in seats is to land a star. Whatever the case, the fact remains that right now in the most basketball-crazed state in America there is a professional basketball team that is good enough to win a championship in the next month or so, yet very few of the locals seem to notice or care.